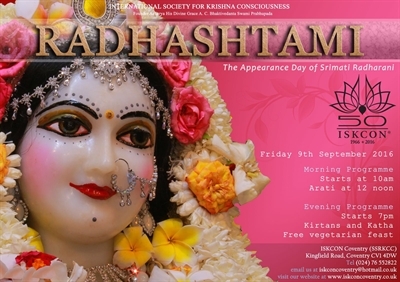 Shree Krishna is coming to celebrate Radha Ranis Birthday! You should also join in the celebration of Radharani's appearance all day on Friday. She appeared at 12 noon. ⭐Also evening Kirtans, dance, new song played by children and a DVD featuring the devotees of Coventry and of course the feast.